Helps people with insomnia and those who have a troubled sleeping pattern. The R-14 Homeopathic Medicine consists of natural ingredients like Ammonium Bromatum, Avena Sativa, Chamomilla, Eschscholzia, Humulus iupulusm, Ignatia, Passiflora incarnata, Valeriana, Zincum Valerianicum. This medicine is for people with insomnia and those who suffer from light sleep, superficial sleep, drowsiness (tiredness) and weariness during the day. In extreme cases with advanced insomnia and exhaustion, dilute 10-15 drops in some water and use thrice a day. At night dilute 20 drops of the homeopathic medicine in sweetened water and drink it. 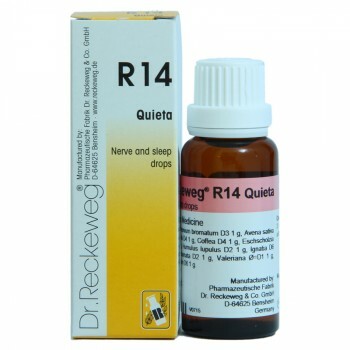 Offering the R-14 Nerve & Sleep Drops 22ml with fast shipping in Karachi, Lahore, Islamabad, Rawalpindi, Peshawar, Quetta and many other cities of Pakistan. 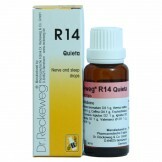 Offering the R-14 Nerve & Sleep Drops 22ml with fast delivery in Karachi, Lahore, Islamabad, Rawalpindi, Quetta, Peshawar and many cities of Pakistan.